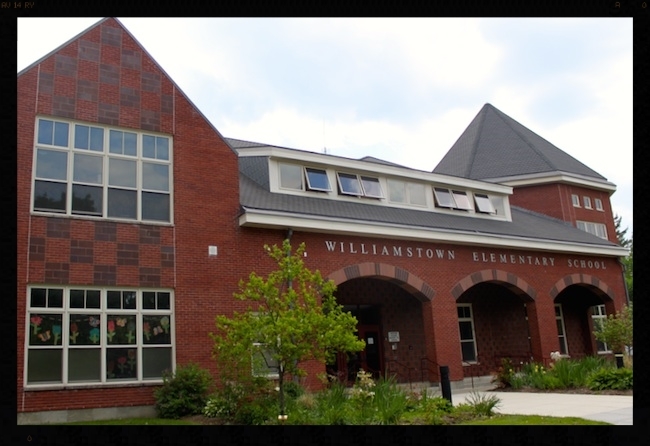 Williamstown Elementary School (WES) is a pre-K to grade 6 elementary school with approximately 450 students. Centered in the picturesque town of Williamstown, WES is surrounded by the Berkshire Mountains. Its culturally rich neighbors include Williams College, the Williams College Museum of Art, the Williamstown Theatre Festival, the Clark Art Institute and MASS MoCA. WES is a member of the Mt. Greylock Regional School District. Lanesborough Elementary and Mt Greylock Middle and High School are the other schools in the district. WES is housed in a state of the art green building that is environmentally responsible, energy efficient, and uses recycled and natural products throughout. In the spring of 2002, WES received the first Green School Grant awarded by the State Department of Education. This funding enabled the placement of photo voltaic panels on the south facing roofs of three wings of the school. Williamstown Elementary School has an experienced, highly educated teaching staff, as well as a skilled paraprofessional and support staff, all dedicated to the success of our students. Approximately 78 staff serve as classroom teachers, special education teachers, specialists, paraprofessionals and support staff. WES has a proud heritage of offering a quality education to its young students. Through highly engaged learning, in a state of the art building, with unique and committed community partnerships, students access the community and its myriad of resources to explore mountains, forests, lakes and streams. Local classroom field studies challenge students to observe, hypothesize and ponder real-life problems in nature and in their town. Our highly skilled staff focuses on environmental science as exemplified by the community garden on school grounds tended by students and parents. A wooden gazebo serves as an outdoor classroom. Through collaborations with local museums and performance spaces, students experience first-hand appreciation of art history, dance and theater. Artists-in residence from Shakespeare and Company annually supplement the fourth grade curriculum of performance art, theater and history. Learning is active. The sixth grade performs an adaptation of a Broadway musical every spring. Students in fourth through sixth grade have the opportunity to participate in instrumental and vocal ensembles. In 2002 fundraising efforts of the WES “Friends of Music”, comprised of teachers, parents, and community members, purchased a Yamaha Grand Piano for the new auditorium. An annual piano concert continues to add to the music program. The Berkshires is home to writers, poets and authors. Parents work with teachers and students during the annual Words Are Wonderful celebration of language to promote writing, reading, and creative self-expression across all grades. Writing across the curriculum begins at the PK level, with fine motor activities such as grasping, and spans through sixth grade bookmaking, poetry, and essay writing. Reading includes language, skill building and literature integrated with science and social studies themes. Williamstown Elementary also has two well-equipped computer labs, two portable wireless laptop labs, and iPad lab, and a bank of three eMac computers in each of its classrooms. A schooled focus of resources and financing through state grants on technology has greatly extended computer literacy at the school. Multimedia projects are integrated in teaching and learning. WES is a future-focused school equipped to meet and enrich the educational needs of its students in the 21st Century.